The Girl In The White Pajamas is the literary equivalent of comfort food. It hooked me in from the opening page and, after the stresses and strains of everyday life, I found myself looking forward to the time spent with my kindle getting my nightly fix. It’s the kind of book that demands nothing of you but delivers entertainment and escapism in spades. The novel starts with a fatal shooting which weaves a web of mystery that becomes increasingly complex and keeps us guessing until the very end. The murder forces Bogie McGruder to leave his new home in Florida and return to Boston, where he has to deal with his estranged family and an ex-lover. At the same time he is forging a relationship with a three year old daughter who he gets to meet for the first time. All of the characters are somehow linked to the murder of a man, who turns out to be a cop and Bogie’s half brother. It becomes a race against time for Bogie and his colleagues at R&B Investigations to try and unravel the mystery. As gripping as the plot is, for me it’s the characters who make the novel so readable. Bogie has survived a horrendous childhood at the hands of a father and step mother who didn’t want him but despite this he is a kind person and a loving father. Bogie’s strength is that he cares about people and consequently is able to create a sense of family wherever he goes. He even takes care of the step mother who made his life hell as she succumbs to dementia and falls on hard times. Chris Birdy also offers us a fabulous cast of likeable, strong female characters, ranging from the delightfully precocious three year old Isabella to Bogie’s designer clad, no-nonsense partner Rose. Bogie’s relationship with Bailey, the mother of his child is as complex as she is. An unsuccessful lawyer, drowning in debt, Bailey’s sense of helplessness in the face of her predicament is conveyed effectively by Birdy and elicits much sympathy. 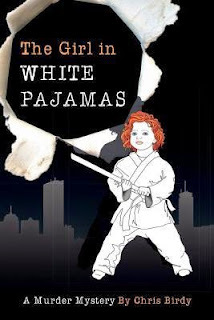 The Girl In The White Pajamas is the first in the Pajama series and my only slight issue with it is that it read a lot like a sequel. So much so that I did in fact check that I was reading the right book. It in no way impeded my enjoyment of the novel but, at times I felt as if I was being plunged headlong into a story and relationships that had already been developed as there is very little background given. What Birdy does give us though is a very satisfying read with characters that are easy to engage with and like. If you’re looking for a novel to take you away from what’s going on in the real world for a while then I think this is the book for you. I am very much looking forward to reading the next story in the series and catching up with Bogie and his ‘family’.